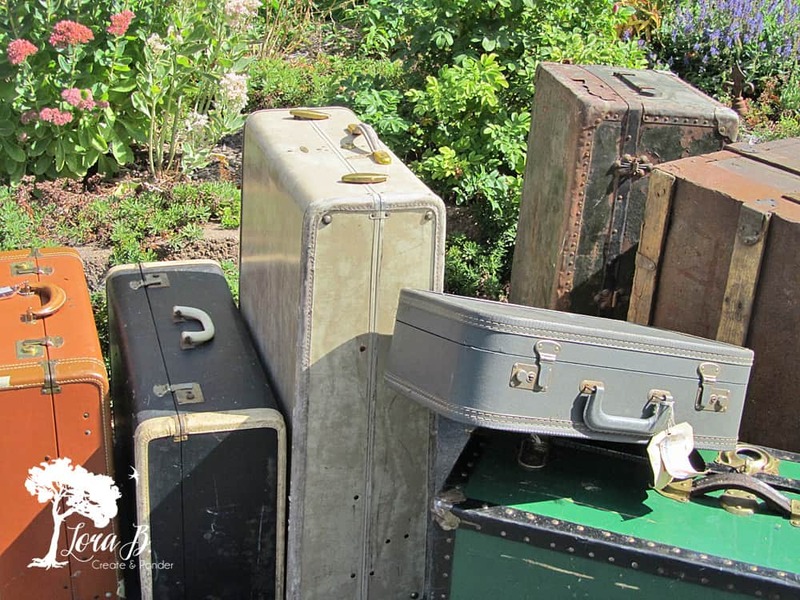 Vintage Suitcases: All Dressed up and Nowhere to Go! 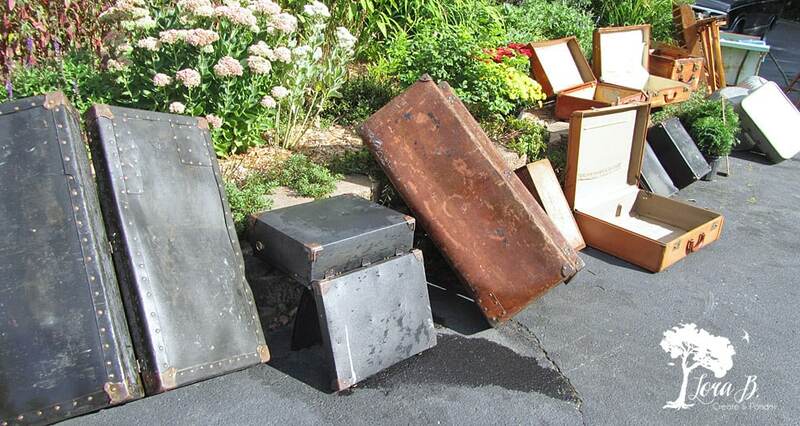 When it seems like I’ve accumulated quite a few, I have a suitcase party in the driveway! I get a bucket of sudsy soap, grab some mild cleanser, like Bon ami, and start scrubbing with a soft, scrubby sponge and an old toothbrush. The little bit of grit cleanser in Bon Ami helps the lighter colored suitcases sing again! 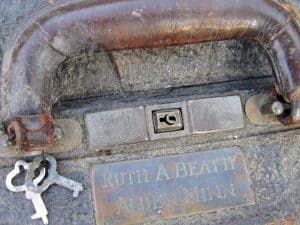 The toothbrush gets the laces clean, where grease and grime has built up over the years. I rinse the soap off quickly with the hose, so as to not damage any of the suitcases color. 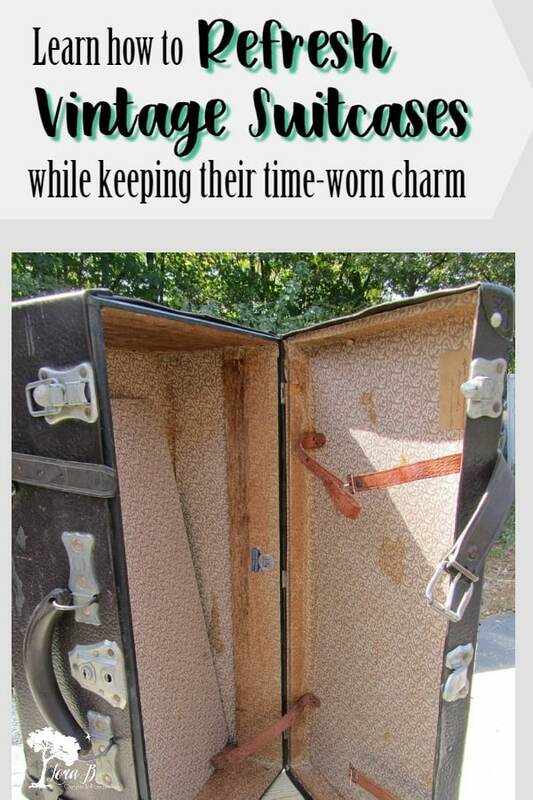 Many times the inside fabrics of vintage suitcases have spills and stains. They also usually have an “old” smell from being closed most of the time. I normally decide to rip the guts out and give the insides a quick wipe out also. 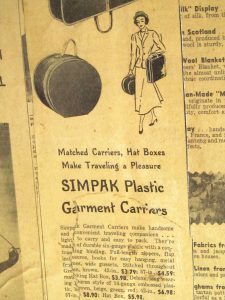 On older vintage suitcases there may be original, patterned paper inside. If this treasure is still intact and in good shape, I like to keep it. I love it when the suitcases themselves have stories to tell. Many times the owner’s names and personal information are hand written on the inside. 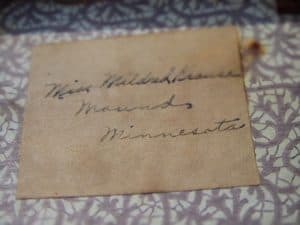 I love the old, beautiful handwriting and seeing where these pieces of history harken from. 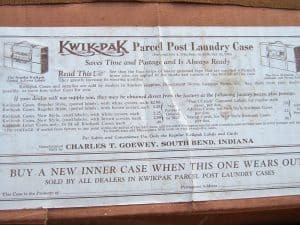 It was a Kwik-Pak Parcel Post Laundry Case that used to be shipped back and forth, probably to and from a soldier! I’d never seen one of these. 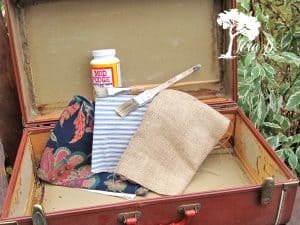 If the lining of the suitcases need to be ripped out, it’s time for a little decoupage! 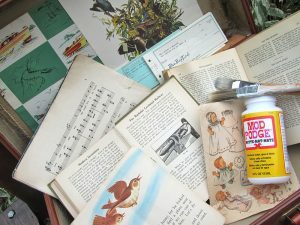 You can use anything from fabric, to old newspaper, maps or children’s books, to vintage music. Match to your style and where you want to use it. 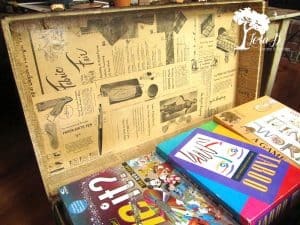 I decided an old trunk would be the perfect place to store our trove of board games. 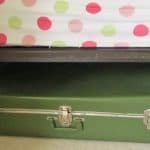 I was actually going to throw this trunk away, till I realized it was the perfect size to slide under my coffee table. 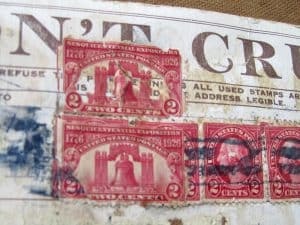 I pulled off the old, ugly contact paper and decoupaged some vintage newspaper inside. I brushed the decoupage medium onto squares of newspaper and then placed them artistically. By the time I finished placing them, the first ones were dry, and I brushed another coat on. After it had dried for several hours, I put a clear coat of water-based poly over to seal it all up. I found it ironic that one of the advertisements was for suitcases! Suitcases come in handy for storage around the house. We’ve got them low down and up high! 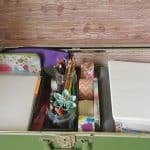 They contain craft supplies, photos waiting for the scrapbook, and hats and mittens. Now we have one with games, too. This is my to-do pile, but I thought they looked kind of cool just stacked in the corner, too! Some of them may need a coat of paste wax on the outside to really make them classy. 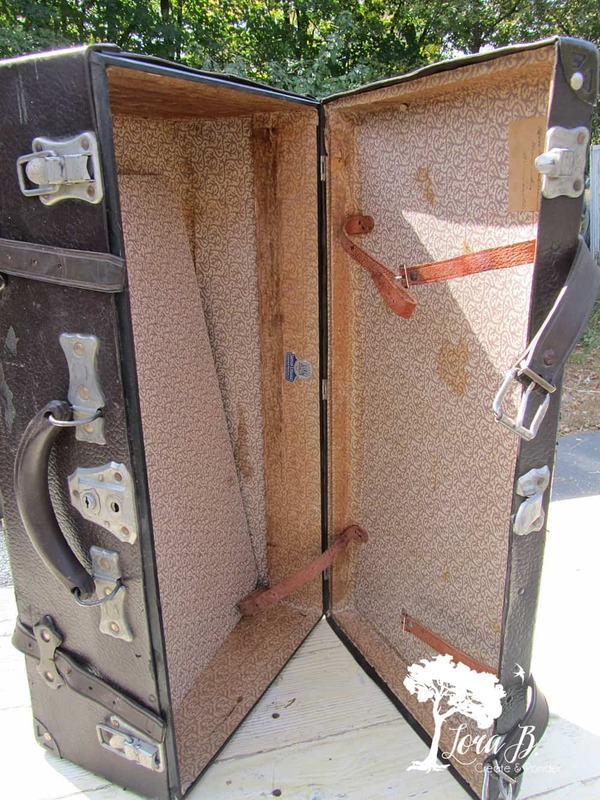 Trunks usually get a coat of poly on the outside to make their beautiful, metal hinges and hardware shine. 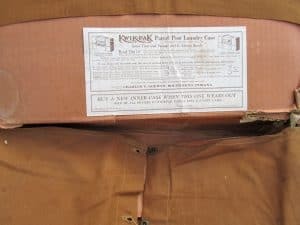 Next time you see one of these at a sale or the side of the road, don’t let it’s not-quite-perfect condition hinder you! A little work, and their usefulness and beauty can be restored! 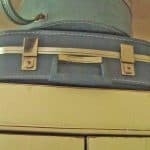 Vintage suitcases have classic architectural character. They’re the perfect item to refresh and re-purpose. No more trips for these beauties; they’re function and beauty can be enjoyed right at home! Do you see the irony of my title now? 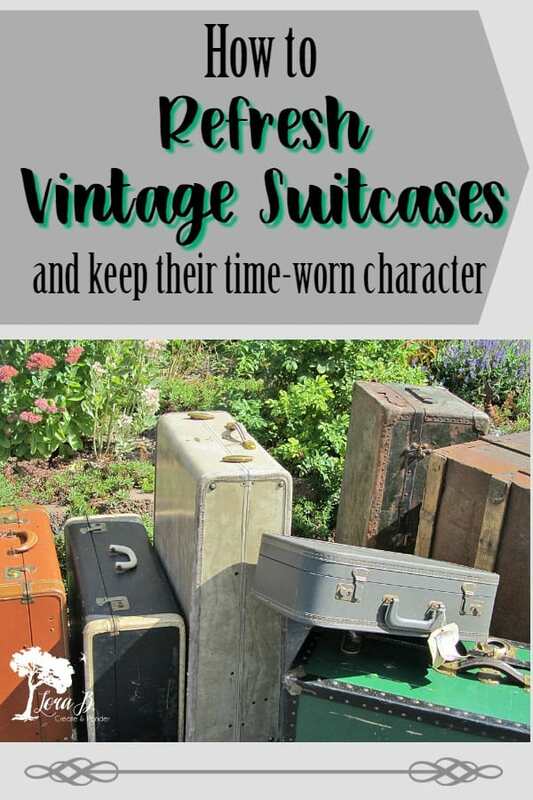 Vintage Suitcases: All Dressed Up and Nowhere to Go? 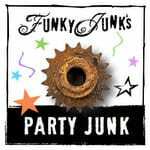 « Junking: Strange and Unusual! 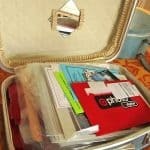 What a treasure trove of suitcases you have, Lora! 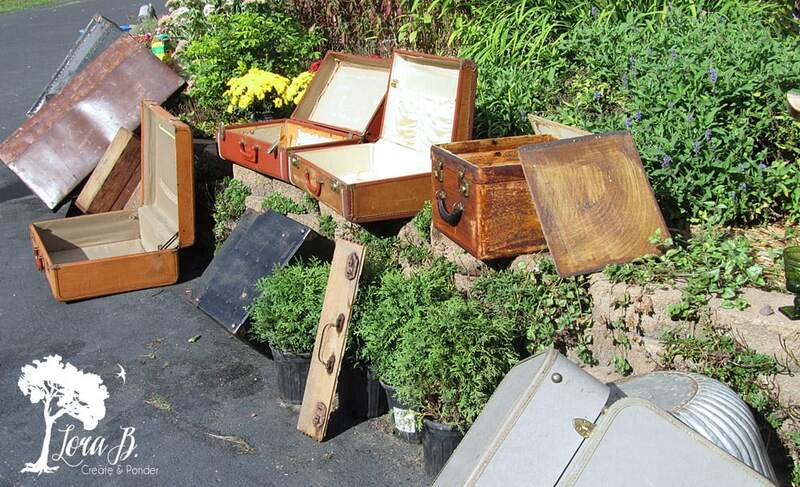 Great storage and restoration ideas. Thanks for sharing all of your posts with us at Vintage Charm. 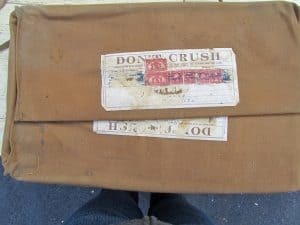 I have quite a few old suitcases too. I did have to put hanging tags on them with the contents written on them because I kept forgetting what was in each one! You have some great tips! Hang tags are a great idea, & especially because I can be so “out-of-sight, out-of-mind”! Thanks for commenting! 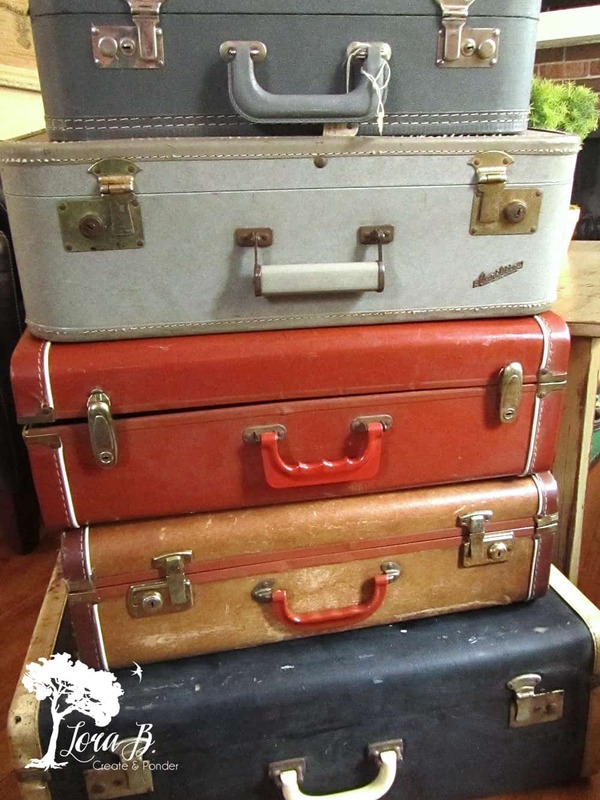 I love old suitcases, I have a stack of them in my living room and one of the old trunks I use for a coffee table! Me too, Tania! Their textures are so beautiful and they’re great storage! Thanks for commenting! Love your blog.